two peas & the dog: halloween. success. • Totally rocked for our living in the 'burbs! • Over 40 witches, princesses, ninjas, goblins, ghosts, pumpkins showed up for some candy. • We had to go buy more candy so we wouldn't run out. • Halloween music is always a must. 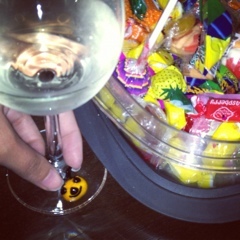 • Halloween wine charms are always a must. For me, not the kids. Obviously. • A few kids walked away saying "I told you she was American". Not sure if that's a plus or not but I'm going to go ahead and put it on the win column.